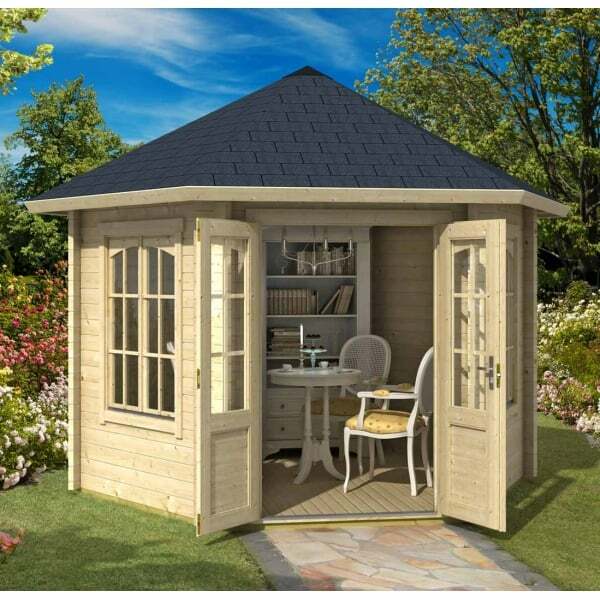 Norland Bainbridge Log Cabin: The Norland Bainbridge log cabin is an attractive 6 sided building that would bring a touch of elegance to the garden or outdoor space. This log cabin has a double door to the front which is partially glazed to allow in natural light, there is also a window in both of the walls next to the door wall. This building will give you stunning views of the garden and is the perfect outdoor retreat away from the house to sit and enjoy a peaceful afternoon even if the weather isn’t brilliant you can still enjoy some fresh air under cover. The two double windows open outwards to let in lots of ventilation when required. This building has 44mm wall logs and is double glazed so you can enjoy this building all year round with only a minimal heat source. This log cabin had a generous footprint of 3.5m x 3.0m which will give you plenty of room inside for your choice of furnishings. This building has 18mm floor and roof boards and includes the pressure treated floor bearers that sit on top of your base to raise the cabin from ground level. All fixtures and fittings are included in the package and due to the traditional log construction there are no screws and nails required in the building of the walls as they slot together with interlocking corner joints. Independent Assembly Service or Self Assembly? a - How to Fit Roof Shingles?